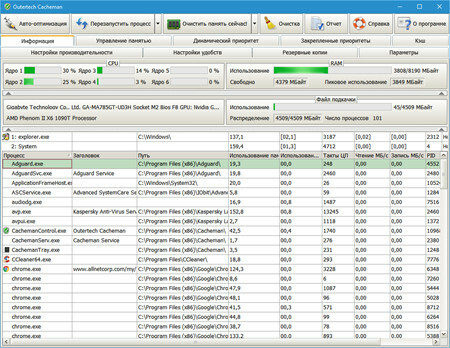 Cacheman is a Windows software designed to speed up your computer by optimizing several caches, managing RAM and fine tuning a number of system settings. Auto-Optimization makes it suitable for novice and intermediate users yet it is also powerful and versatile enough for computer experts. Backups of settings ensure that all user modifications can be reversed with a single click. Cacheman takes Memory Management to the next level. You can define which applications have the most importance to you. When your system runs out of RAM Cacheman will take it away from non essential programs and give it to the important ones. This is a drastic improvement to the default Windows memory management. You can even limit the RAM a specific application can use. Cacheman displays upto three icons in the Windows Tray Area.